The study by researchers with the Coastal Plant Ecology Lab at Virginia Commonwealth University offers important insights into the ecological and geomorphic processes occurring on Virginia's chain of 23 uninhabited islands stretching from Assateague at the Maryland border to Fisherman Island near the Chesapeake Bay Bridge-Tunnel, as well as other barrier islands along the East Coast that help protect the mainland from storms that -- thanks to climate change -- are increasing in frequency and intensity. Barrier islands have been shown to be naturally resilient in response to relative sea-level rise by migrating landward via an "overwash" process that deposits sediment onto the islands' backbarrier marsh, thereby maintaining elevation above sea level. "In coastal systems, ecology has pretty much been ignored and we are showing that a species which is expanding specifically due to climate warming is fundamentally changing island migration," said Julie Zinnert, Ph.D., principal investigator with the Coastal Plant Ecology Lab and assistant professor in the Department of Biology in the College of Humanities and Sciences. "This paper underscores the importance of looking at change across all sub-environments on a barrier island and not just beach shoreline erosion." The study shows how the interplay between elevation and interior island vegetative cover influences landward migration of the boundary between upland and marsh -- a previously underappreciated indicator that an island is migrating -- and, thus, the importance of including ecological processes in the island interior into coastal modeling of barrier island migration and sediment movement across the barrier landscape, Zinnert said. The study, "Connectivity in coastal systems: barrier island vegetation influences upland migration in a changing climate," will be published in a forthcoming issue of the journal Global Change Biology. "This study is a reminder of the interconnectedness of what people often see as separate ecosystems," said Colette St. Mary, a National Science Foundation Long-Term Ecological Research program director. "For example, coastal plant communities alter wind patterns and other variables, in turn shaping offshore islands. To address the effects of our changing environment, we need to understand this interconnectivity." PHOTO CAPTION: In response to sea-level rise, barrier islands tend to migrate landward via overwash in which sediment is deposited onto the backbarrier marsh. The researchers assessed the importance of interior upland vegetation on movement of the marsh-upland boundary in a transgressive barrier system. Over time, disturbance-resisting landscapes with greater topographic variability and vegetative cover resulted in higher rates of shoreline erosion and little to no transition marsh to upland (A). Disturbance-reinforcing landscapes have lower topographic relief, sparse vegetation and experienced higher rates of marsh to upland conversion (B).In response to sea-level rise, barrier islands tend to migrate landward via overwash in which sediment is deposited onto the backbarrier marsh. The researchers assessed the importance of interior upland vegetation on movement of the marsh-upland boundary in a transgressive barrier system. Over time, disturbance-resisting landscapes with greater topographic variability and vegetative cover resulted in higher rates of shoreline erosion and little to no transition marsh to upland (A). 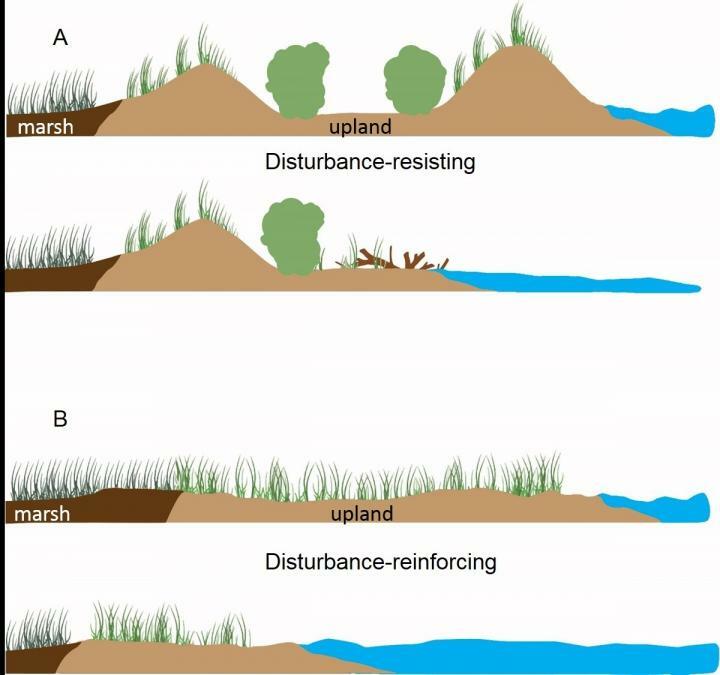 Disturbance-reinforcing landscapes have lower topographic relief, sparse vegetation and experienced higher rates of marsh to upland conversion (B).